Many readers will wonder, when their eye catches this review, or when they amble past a shelf full of The Girl in the Spider’s Web, “How is this possible?” Stieg Larsson, the author of the internationally famous Girl with the Dragon Tattoo, did unfortunately pass in 2004. Upon his passing he had already written three of the books in the Millenium series. However, he had planned for this series to span ten books, and before he died he had been working furiously to finish the fourth book. A few years after Larsson’s death, his estate management team hand-picked an author to complete this fourth book. They selected David Lagercrantz, a Swedish journalist and author who has also worked as a crime reporter. 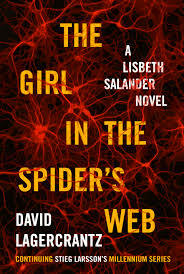 Many were skeptical of this decision and remained staunch that no author could replicate the dark, complex world of Larsson’s thrillers; however, after reading the newly released Girl in the Spider’s Web, it is clear that Lagercrantz was the right man for the job. There are subtle differences between the two authors’ writing styles. Lagercrantz likes to describe unimportant particulars in unnecessary detail, such as noting the brand of water bottle characters choose to drink in particular scenes, or each street that comprises an intersection. However, apart from small writing quirks such as this, the dramatic, edge-of-your-seat, action-packed style that readers have come to expect from Larsson is just as omnipresent in this novel. Characters alluded to in previous novels take on primary roles. The NSA, and thus the U.S., play a central part in Larssen’s plot for the first time ever. The Hacker Republic, Wasp, and everyone’s favorite vigilante, Salander, are up to their old tricks. Assassins, evil relatives, mathematical savants, paranoid professors, and inquisitive old Blomkvist all come together in this fast-paced thriller to create a novel that will draw you in from the first murder and keep you hooked until the final code is cracked. And for readers who can’t get enough of that mysterious girl with the dragon tattoo, the ending of this novel leaves several loose ends that almost certainly portend a fifth novel.